Objective. This study describes the magnitude and characteristics of nutritional rickets and associated risk factors among children in Qatar. Subjects. A consecutive sample of 730 healthy subjects who visited the primay health care clinics were approached and 540 (73.9%) subjects gave consent. Mehods. Nutritional rickets diagnosis was based on clinical radiologic and biochemical parameters and normalization of alkaline phosphatase level after 6 weeks course of daily vitamin D therapy. Results. The study revealed that 23.9% of the studied children had nutritional rickets. The mean SD age of those with rickets (3.76 years 1.51) was slightly higher than those without rickets (3.57 years 1.45). Family history of vitamin D deficiency (44.2%; P = .001) and diabetes mellitus (53.5%; P = .002) were significantly higher in rachitic children than in nonrachitic children. The children with rickets spent a significantly shorter average duration (26.86 minutes 19.94) under the sun than those without rickets (30.59 minutes 15.72; ). A significantly larger proportion of rachitic children was afflicted with vitamin D deficiency (75.2% versus 62.2%; ), secondary hypothyroidism (100% versus 7.5%; P = .009) and muscular weakness (56.6% versus 26.3%; ). Conclusion. The most important risk factors were low vitamin D and calcium intakes, lack of exposure to sunlight, prolonged breast feeding without supplementation of vitamin D.
Nutritional rickets (NR) is a disease that afflicts children and adolescents during times of rapid growth . Vitamin D deficiency and/or nutritional rickets remain prevalent in developing regions of the world and rank among the 5 most common diseases in children [2, 3]. Prevalence of nutritional rickets in developed countries appears to be rising [2–7]. Suggested reasons in the literature for its reemergence include complacency in fortifying food, changing lifestyles where children spend most of their time indoors on various forms of technology and globalization which has resulted in immigration of different peoples to different geographic locations [3, 8, 9]. NR is distinct from other types of rickets in that it is merely caused by a simple deficiency in vitamins and nutrition and thus can be easily corrected if detected early . A growing body of literature has highlighted that NR should be viewed as having a spectrum of pathogenetic mechanisms which lie between the following three milestones [6, 10]. On one side of the spectrum are those with classic vitamin D deficiency, as studies have found among nonsupplemented breastfed infants , while on the other side of the spectrum are those with pure calcium deficiency, yet with normal vitamin D stores as cases from Nigeria and Bangladesh have shown [11–14]; and in between these two are those with marginal to low vitamin D stores and a diet deficient in calcium or high in phytates which impair intestinal absorption of dietary calcium and may be the main cause of rickets globally . Those particularly affected live in certain latitudes as is evident from numerous studies about immigrants to other nations [9, 15, 16]; winter season, atmospheric pollution and geographical latitude are also known to impair vitamin D absorption  and finally children spending prolonged hours inside on TV/computers rather than in the sun . The second category of at risk individuals are those with an insufficient dietary intake of vitamin D: infants whose mothers are vitamin D deficient, as an infant's vitamin D concentration corresponds to that of its mother and especially breastfed infants (without vitamin D supplementation) as breast milk is very low in vitamin D .
This study describes magnitude and characteristics of vitamin D deficiency rickets and associated risk factors among children in Qatar, a very sun rich country. This is a cross-sectional study which was designed to investigate the prevalence of NR in the young Qatari population aged 0–5 years. The survey was conducted over a period from August 2007 to December 2009. The study was approved by the Hamad General Hospital, Hamad Medical Corporation. All human studies have been approved by the Research Ethics Committee and have been performed in accordance with the ethical standards laid down in the Declaration of Helsinki of 1964. All children were included in this study after informed consent from parents. Diagnosis criteria for Rickets were based on the blood tests such as the serum levels of calcium, phosphate, alkaline phosphatase, parathyroid hormone, and 1,25-dihydroxyvitamin D, to facilitate case confirmation. Radiographic signs of rickets were supportive of the diagnosis. Rickets was diagnosed by radiographic signs at the wrist or knee, as determined by a radiologist at the patient's local institution. Furthermore, bone biopsy is rarely performed but will confirm rickets. Skin colour was determined by the pediatrician's subjective assessment. Additional recorded information included the mother and child's history of calcium and vitamin D intake and sun exposure. Finally, each patient's record was reviewed by a physician, as well as radiological findings, infant nutrition, the presence of other nutritional deficiencies and exposure to sunlight. Nutritional rickets diagnosis was based on clinical radiologic and biochemical parameters and normalization of alkaline phosphatase level after 6 weeks course of daily vitamin D therapy. A consecutive sample of 730 healthy subjects who visited the PHCs for any reason other than acute or chronic disease, for example for vaccination, were approached and 540 subjects gave consent; with a response rate of 73.9%. The remaining 190 children which were originally approached were excluded from the study due to either refusal of the parent to participate or difficulty in drawing blood from uncooperative subjects. Subjects were classified into three categories: severe vitamin D deficiency which is defined as a serum level of 25-hydroxy vitamin D (25(OH) D) lower than 10 ng/ml. Mild to moderate deficiency is defined as serum 25(OH) D between 10–20 ng/ml and optimum levels between 20–80 ng/ml (Smotkin-Tangorra et al. 2007). Venous blood samples were collected into plain tubes, and serum was separated and stored at C until analysis. 25(OH) D was estimated by a competitive binding radioimmunoassay (RIA) technique using a kit DiaSorin/ the Diagnostic Specialist (DiaSorin Corporate Headquarter, Saluggia (Vercelli), Italy). Serum levels of the following biochemical parameters were determined according to standard laboratory procedures: hemoglobin, serum calcium, serum phosphorus, and serum phosphate. A specially designed questionnaire was administered by one of the investigators to both mothers of patients and mothers of control subjects to assess the role of social, nutritional, and other related factors in the pathogenesis of nutritional rickets. The parents of the participants were interviewed by health professionals and nurses concerning their sociodemographic information such as age, gender, nationality, educational level, occupation, socioeconomic status, and consanguinity. Also, it included assessment of nondietary covariates such as height, weight, colour of the skin, family history of medical illnesses such as vitamin D deficiency and diabetes, physical activity and duration of exposure to sunlight. Furthermore, the questionnaire included questions relating to dietary intake including vitamin D and type of feeding. Children's medical records were also assessed by a physician or nurse for the presence of current or past medical illnesses which include weakness, gastrointestinal disorders, fractures, delayed milestones, rickets, and secondary hyperparathyroidism. The statistical analysis of the study was conducted using SPSS 18.0. Student's t-test was used to ascertain the significance of differences between mean values of two continuous variables and confirmed by nonparametric Mann-Whitney test. Chi-Square for trends and Chi-square analysis was performed to test for differences in proportions of categorical variables between two or more groups. In 2 2 tables, the Fisher's exact test (two-tailed) replaced the chi-square test if the assumptions underlying chi-square violated, namely, in case of small sample size and where the expected frequency is less than 5 in any of the cells. The Pearson's correlation coefficient was used to evaluate the strength association between two variables. The level was considered as the cutoff value for significance. Of the studied children 23.9% were found to have NR. Table 1 shows the socio-demographic characteristics of the identified children with rickets. The mean age of children with rickets (3.76 1.51) was slightly higher than those without rickets (3.57 1.45). Further, significantly more families of the children with NR had a higher financial income, more mothers had a university education (30.2%; ), and were housewives (65.9%; ). Socio-demographic characteristics of children with rickets compared to healthy controls. Table 2 displays the assessment of the non-dietary covariates in studied children. The majority of the children with rickets had a BMI within either the normal (38.8%; ) or underweight (57.4%; ) range. Family history of vitamin D deficiency (44.2%; ) and diabetes mellitus (53.5%; ) were significantly higher in rachitic children than nonrachitic children. A significantly smaller proportion of children with NR were breastfed (63.6% compared to normal healthy children (96.4%) ( ). The children with NR spent a significantly shorter average duration (26.8 min 19.9) under the sun than those without rickets (30.59 min 15.72; ). Characteristics of lifestyle and family history of medical conditions of children with rickets compared to health controls. Table 3 presents the baseline serum biomarkers for studied children. The children with NR had significantly lower mean values of vitamin D serum concentration, calcium, magnesium and phosphorus, and significantly higher blood urea nitrogen, PTH and creatinine. A significantly higher proportion of children with rickets (31.8%; ) had severe vitamin D deficiency. 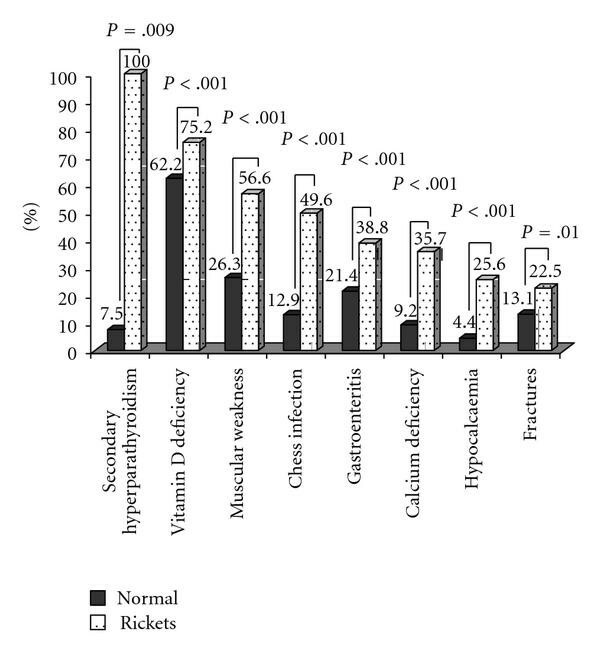 As can be seen from this table, the outcome of 6 weeks treatment with 25 (OH)D3 and calcium, mean 25 (OH)D3 levels had increased to 20 nmol/L, the mean alkaline phosphatase level had fallen to 500 IU/L, serum calcium level had increased to 2.13 nmol/L. Baseline serum biomarkers of children with rickets compared to normal healthy children. The most frequent clinical signs among children in the 0–5 years age group included wide wrist (24.8%); rachitic rosary (20.9%); frontal bossing (14.7%); wide anterior fontanelle (12.4%); bow legs (9.3%). An assessment of the dietary and vitamin D intake in the studied children with and without rickets is presented in Table 4. Both rachitic and non-rachitic children had a poor dietary intake of vitamin D rich foods and supplements. Assessment of diet habits and vitamin D intake in the studied children with and without Rickets. The frequency of possible clinical manifestations in the studied children with and without NR is displayed in Figure 1. A significantly larger proportion of rachitic children were afflicted with vitamin D deficiency ( ), muscular weakness ( ), chest infections ( ), gastroenteritis ( ), Hypocalcemia ( ), secondary hyperparathyroidism ( ), and fracture ( ). Frequency of possibly related clinical manifestations in the studied children with and without Rickets. Many studies suggest that NR is a social disease, naming poverty as the main culprit. Recently a study conducted in Turkey found that NR was a disease of the 'underprivileged' being strongly correlated with negative social background and lack of vitamin D supplementation [7, 20, 21]. Similarly a Lebanese study found that children and adolescents of higher socioeconomic status were more likely to eat calcium and Vitamin D fortified foods thus protecting them from development of NR . Nonetheless, an Egyptian study did not find poor living conditions to be related to NR; in fact it is found that maternal education was higher in patients with NR than in controls . Similarly, a study conducted in Saudi Arabia  found that children of lower socio-economic status were more exposed to sunlight as they were allowed to play outside more often than children of other classes. Recent study in Turkey  reported that vitamin D deficiency and/or nutritional rickets can develop very early in infancy and is usually characterized by severe hypocalcemic symptoms. Also, their results revealed that maternal vitamin D deficiency and limited sunlight exposure are the leading risk factors for the development of nutritional rickets in infants. Furthermore, all pregnant and lactating mothers should be supplemented and vitamin D supplementation of all infants should begin during the first days of life. In our study it was also found that rachitic children spent significantly less time in the sun, which could explain the higher prevalence of nutritional rickets in children of higher social economic status in the present study. The fact that our study found a positive correlation between family history of vitamin D deficiency and diabetes mellitus among rachitic children suggests that socio-demographic factors are again important predictors of NR (as Pettifor  suggests). It also indirectly confirms the relationship between vitamin D deficiency and diabetes mellitus found in other studies . Although being overweight is thought to increase the susceptibility to vitamin D deficiency due to sequestration of vitamin D by the large body fat pool , our study found that most of those with rickets were underweight. This finding is similar to a study conducted in Saudi Arabia  which found rachitic children to have a lower BMI than non-rachitic children. Our study found similar trends to other studies [22, 26] in terms of decreased vitamin D, calcium, phosphatase, magnesium, and phosphorous and increased blood urea nitrogen, PTH and creatinine among rachitic children in comparison to non-rachitic children. Moreover, it revealed that both rachitic and non-rachitic children had a very poor vitamin D intake as other studies have confirmed. A combination of findings from our study suggests that a considerable proportion of NR may have been caused by calcium deficiency. These findings include, the relatively similar prevalence of vitamin D deficiency between NR and control group (75% versus 62%); the fact that more children with NR had vitamin D supplementation; one-third of studied children had a lack of milk intake; and only a minority of children had severe vitamin D deficiency ( 10 ng/ml). This is a surprising finding, considering that Qatar is an affluent country. Most cases of NR caused by calcium deficiency occur in countries where significant proportions of the population have malnutrition [11, 13, 14]. It is most probable that a large number of cases are caused by a combination of low vitamin D stores and a diet deficient in calcium or high in phytates which impair absorption of dietary calcium . Unfortunately, dietary intake of phytates was not measured in this study; future research should investigate whether dietary intake of phytates significantly affects calcium levels in the Qatari population. There are several other potential limitations of this study. Although we had a large sample size, in comparison to other studies conducted on nutritional rickets, the consecutive sample may have a small bias towards overrepresenting NR cases. In addition, the complex nature of nutritional rickets makes it very difficult to identify an exact pathogenetic mechanism in the study population. While it was beyond the scope of this paper to measure the role played by the tribal nature of the Qatari population (i.e. a genetic risk factor) that may predispose this population to nutritional rickets, it is still important to acknowledge that this may have played a role in the high prevalence of NR cases. The present study revealed that nutritional rickets is highly prevalent among children in the State of Qatar. It can be considered as a multifactorial condition, in which lack of exposure to sunlight, calcium deficiency, prolonged breast feeding without supplementation and inadequate weaning practices are central. Health education is important as it can influence all of the above factors. This work was generously supported and funded by the Qatar Foundation Grant no. UREP 3-17-71 and Qatar Foundation Grant no. NPRP08-760-3-153. The authors would like to thank the Hamad Medical Corporation (HMC RP no. 8226/08) for their support and ethical approval. Also, they are very grateful to both reviewers who improved presentation and quality of paper.